When Board of Commissioners Chair Richard Higgins says, “We’ve got it all in Hall,” you might think the native Hall County resident is just promoting a tagline. You’d be wrong. Not only does Higgins mean it, there are plenty of facts to back it up: Revitalized downtowns where the biggest concern is managing the growth that keeps heading their way. A solid base of industry. Three institutions of higher education. One of the top hospitals in the state. And an unemployment rate that’s among the lowest in Georgia. That’s before we even mention the vistas of Lake Lanier and the foothills of the Blue Ridge Mountains. So take Higgins at his word, and head to Hall County. It’s not every day that a college campus almost doubles in size. But that’s happening this month as Lanier Technical College officially cuts the ribbon on new facilities off Georgia 365 and Howard Road. It’s a big event for the college, but also for economic development in the county: All that new floor space – from 180,000 square feet to about 335,000 – means room to offer new and expanded programs that address workforce training. It’s the top project in Hall County, says Chamber of Commerce President and CEO Kit Dunlap. “This new campus allows us to create several new programs that the community has been asking for,” says Ray Perren, president of Lanier Tech. Diesel mechanics, construction technology, marine technology (especially fitting since the college shares its name with Lake Lanier), plus an expansion of the culinary arts program and a new allied health building. “There’s such a great need for health technicians, such as radiology and surgical technicians,” says Perren. The school also plans to start a program offering an associate’s degree in nursing. Healthcare is a major industry in Hall County – Northeast Georgia Health System (NGHS) is one of the largest employers in the area and is itself starting a graduate medical education (residency) program in 2019. And Brenau University, a private institution whose main campus is in Gainesville, is also expanding its health programs. It offers graduate degrees in physical and occupational therapy and will offer specialized training for a physicians’ assistants program in partnership with NGHS. Brenau recently expanded its space for graduate programs in downtown Gainesville. Lanier Tech’s new digs have a full-service conference center with a terrace space for community gatherings and an amphitheater for both the college and community to use. And that makes sense, since Perren explains that the school was founded in 1964 by “the people of Hall County” – the chamber of commerce, the Gainesville and Hall County school systems and the city and county government. “We’ve had a long history of close relationship with all the seven counties we serve, and particularly Hall County,” he says. The school works closely with local businesses to deliver targeted education and training. Industry representatives “review our curriculum, look at our labs and tell us about the progress of our graduates,” says Perren. In addition to offering dual enrollment in 10 different school districts, Lanier Tech has an apprenticeship program where it partners with a specific industry to allow students to work full-time in the business while pursuing an associate’s degree at the college. Lanier Tech has close to a 100 percent job placement rate, and in 2017 almost 100 percent of graduates were employed in the field they studied. The new campus, says Perren, was designed to be a showcase for technical education – not just in Georgia, but for the whole country. “This should be a first choice after high school,” he says. “A technical college is not a place to go because you can’t go anywhere else. It’s a place to go because you’re looking to build an exciting career” – like the student who graduated from the school’s auto collision repair program and now makes more than $100,000 as a manager of a collision shop (with no school loans to worry about, Perren is quick to add). “What a great opportunity that is,” he says. And not just for Lanier Tech. The University of North Georgia is expanding its Gainesville campus into Lanier Tech’s vacated space, moving five programs into the soon-to-be empty buildings. Gainesville and Hall County have a strong manufacturing and industrial base that keeps the region humming. Last year new and existing businesses added 900 jobs and $170 million in capital investment, including expansions by Japanese equipment manufacturer Kubota and Mars Wrigley, the candy maker. Mincey Marble built a new manufacturing plant and corporate offices in Gainesville Business Park in South Hall to consolidate its operations, and logistics company Tatsumi Intermodal USA added a 113,000-square-foot building to its operations in Gateway Industrial Centre. County and city officials are watching growth closely and preparing for the future. A new exit – Exit 14 off I-985 in South Hall – should further open up commercial development along Thurmond Tanner Parkway, says Higgins. More infrastructure investment comes at Gainesville’s Lee Gilmer Airport in the form of a $500,000 renovation and upgrade of the brick terminal, which dates to World War II. An Appalachian Regional Commission grant and a One Georgia grant are being used to fund the project. The second phase will involve planning for future expansion, using a portion of the grant money. “We’re excited about the short-term possibilities of what’s going to happen with our terminal renovation, and then the longer term of using that money to plan where we expand,” Lackey says. A new exit will also help with another area of rapid growth: residents. South Hall is getting more populous as development pushes up from Gwinnett County. Jock Connell, Hall County administrator, describes residential building as “picking up in a feverish pace,” especially in South Hall. 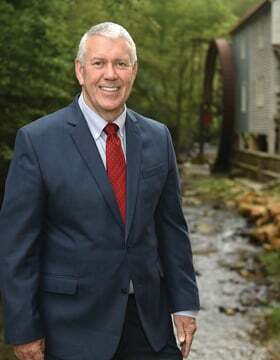 When Flowery Branch Mayor Mike Miller took office in 2010, the city had just over 3,500 people. Now it’s about 8,500 with projections for 13,000 in the next four years, he says. Miller adds that within a mile of the town’s new city hall complex, construction has been approved for just over 2,000 homes. The new Exit 14 will mostly be within the city limits of Flowery Branch and should provide some significant traffic relief to Spout Springs Road during rush hour. Miller expects commercial and retail to continue to grow downtown, where a number of local businesses have found a home. He recalls going downtown in 2010 and being the only car on Main Street. “Now on a Friday night, you have to fight for a parking space,” he says. The city recently launched “Third Friday Block Parties” in conjunction with the Lake Lanier Convention and Visitor’s Bureau and set records with a Gilmore Girls-themed event that transformed downtown into the fictional Stars Hollow for one night. The event drew thousands, with some coming from as far away as Kentucky. Gainesville’s a lot bigger (population 40,000) but its downtown is transforming, too. Several big projects are coming out of the ground: a new 64,000-square-foot office building that will include Carroll Daniel Construction’s headquarters; mixed-use Parkside on the Square that will feature condos as well as 15,000 square feet of restaurant and retail; and Walton Summit, which has a mix of income-based and market-based housing. Lackey notes that the developer of Parkside, Tim Knight, has an option on another city-owned lot adjacent to the new Carroll Daniel building, which may be developed into multi-family housing atop some 40,000 square feet of retail. The four-acre site of the old jail, now renamed Midtown City Block, is on the cusp of redevelopment into residential, too. And in January a $2.5-million expansion and renovation of the library on the square will get underway, according to Dunlap. “There’s always been a strong employment base in downtown Gainesville, but adding that needed dimension of the 24/7 presence of people living in the downtown area – we’re excited about that,” Lackey says. The city is also proposing a tax allocation district (TAD) for an older part of Gainesville along Browns Bridge Road, where there’s some aging retail, to spread the success from downtown. Both Lackey and Miller are thinking hard about the future and what all the growth means for their respective cities. Lackey lists several other hot corridors in Gainesville, including on the east side of town and along Dawsonville Highway/Hwy. 53 to the west. “People want to live there and want to try to get their businesses in there, and there’s decreasing amount of land available for that,” Lackey says. “That’s going to be a great corridor that comes with the challenges with moving people through there and giving them the quality of life they expect. … We’ve got to try to stay ahead of the curve – or at least catch up with the curve – on that. We’ve got to be planning” for that kind of growth. One part of that plan is a new $19.7-million bridge over Lake Lanier recently opened to accommodate the area’s growth. Miller is thinking ahead, too. “Roads and infrastructure, getting around,” he says. “We’ve got some roads that are already congested, and we know we’ve got more growth coming … there’s a plan to widen 985 from the I-85 split. As that happens, we hope to widen Spout Springs. There are some big projects that are critical, seeing that growth.” Other things to watch, he says, are water, sewer and providing police and other public safety services. It’s big money: $314 million. That’s how much tourism brought into Hall County in 2017. This year should top that, with the International Canoe Federation Dragon Boat World Championship at Lake Lanier Olympic Park that was expected to bring in 5,000-10,000 spectators and 1,000 athletes last month, according to Dunlap. It’s the first time the championship was held in the U.S. Ten to 20 people sit in one boat, side by side, wielding a single-blade paddle. There’s a drum on board, too – everyone paddles to its rhythm. Lake Lanier is the jewel in Hall County’s tourism crown, but it’s hardly an island, if you’ll forgive the pun. Dunlap also mentions Don Carter State Park, opened in 2013. It’s the only state park on the lake and just opened 12 miles of horse trails this past summer. The Atlanta Botanical Gardens Gainesville hosts events and some big-name concerts. And of course, the Atlanta Falcons headquarters and training camp in Flowery Branch draws NFL fans eager to get a glimpse of what the season may hold before the team heads to the Benz in Atlanta. From Mountain Fresh Creamery and Glo-Crest Dairy’s farm tours to the 500-acre Jaemor Farms, famous for its annual strawberry and peach events, Hall County benefits from the local food movement and pulls in people who want to see where their food came from. Mountain Fresh offers homemade ice cream in a variety of flavors, and Jaemor Farms has its own market and bakery – all helping to fuel one of the mainstays of the local economy. You hear that a lot from the Echols family at Jaemor Farms, according to agritourism and marketing coordinator Caroline Lewallen. Founded in 1912, the farm, which practices sustainable agriculture, is still in the family. But it’s come a long way since patriarch Jimmy Echols stood on the side of Old Cornelia Highway with a tray of peaches for sale (“direct to the consumer,” Lewallen notes). Now Jaemor Farms is the No. 2 attraction in Hall County, behind only Lake Lanier, drawing more than 750,000 visitors a year. You can still buy peaches, plus strawberries, blackberries, watermelon, squash and zucchini, tomatoes and pumpkins, at Jaemor Farm Market on Cornelia Highway (there’s a satellite location in Commerce, as well). You’ll find milk from nearby Mountain Fresh Creamery and jams, jellies and preserves, too. That’s one way the farm taps into agritourism; its wildly popular annual events are another. The biggest draws are the strawberry festival in May and the peach U-pick day in August (the Georgia Belle peaches alone are worth the drive) that also feature food and local arts and crafts. In the fall, Jaemor is famous for its corn maze, open through Nov. 4 this year, and its U-pick pumpkin patch. The theme for this year’s maze is “Hometown Heroes” and features designs of a firefighter, EMT and police officer. There are even Date Nights at the Farm – two evenings (one in May and one during corn maze season) where couples or groups can enjoy a catered dinner and live music or a deejay. In the fall, you can take a private stroll through the corn maze. “It’s a way to have different scenery than just going to a restaurant [with] a loved one or group of friends,” says Lewallen. The farm also connects with the community by offering field trips to elementary school students from surrounding counties who pick apples, pumpkins or strawberries while learning about the plants. In the summer, the farm hosts canning classes in partnership with the Hall County extension office. Lewallen recently won the Young Farmer and Rancher Excellence in Agriculture Award from the Georgia Farm Bureau for her work in bringing agriculture-based lessons into Hall County classrooms. All this adds up to a significant contribution to the area’s bottom line: Lewallen says an economic impact calculation a few years ago was around $18 million annually. October is the busiest month, followed by July.